Impressed anchor mark on (English?) porcelain figure:- Hi all, Have been visiting this site for some time but this is my first post. My name is David and I live in Sydney (originally from Blackpool, Lancs) I hope that you can assist me. I bought the figure just recently. It is 15 cms high. The seller had owned it for 30+ years but was unsure about the maker. He had an idea that it could be Chelsea. I know just about nothing about Chelsea but, via Google, have my doubts about it being so (though I'd love to be wrong!!). I believe the Chelsea raised anchor mark sat on a 'tablet" or plinth. Also, this piece seems in extremely fine condition and the potting seems quite fine/refined compared to the (albeit very few) pictures of Chelsea from that period on the internet. I can not find a match for this anchor mark. Can anyone assist/educate me please?? Lovely to see such a nice contribution from an old friend to the site, welcome to the public forums. Glad you are finding the site useful. First thing to say is whether a genuine Chelsea or not, I love this piece. From my professional point of view (as a figurine sculptor, not an expert) it is beautiful and intricate, yet charmingly naive at the same time. The colours are beautiful and the pose is gentle and flowing and the composition of the animals and backdrop is tight and pleasing to the eye in every respect. 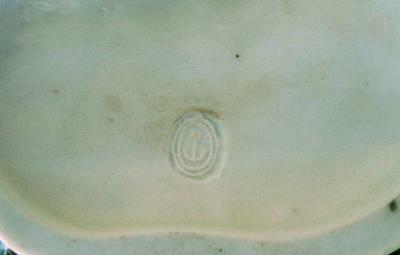 It has the exact mark of the Chelsea factory of the 'Raised Anchor Period' (1749-1752). However, it is likely a later copy. An original would be unlikely to have survived other than in museums and would be valuable. Knowledgeable contributors feel free to try to help out more with this one (check out the comments section below for replies). For general advice on how to either price up your collection or find replacements for it, I wrote this page: The Searching Secrets To Finding Your China Replacement Online ….more. This is a modern copy. It is not even a copy of a Chelsea raised anchor figure. 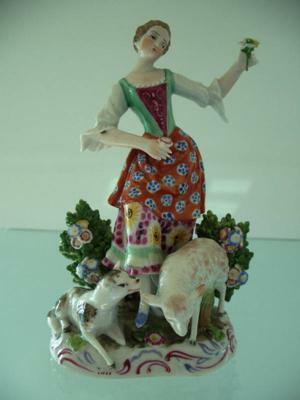 It is VERY much in the style of a German Sitzendorf figure of about 1900. I had a pair of figures once by the same maker and they were NOT even porcelain , they were pottery. There are a lot of these about and they do fool newcomers to porcelain collecting. Mine had fake gold Chelsea anchors on the back of them,. I erased these and put them on Ebay for Buy it Now for £25.00. I am not a kind person I just didn't want a lot of grief from a buyer when they found out what they were, which they undoubtedly would have done sooner or later . I had seen some from the same makers go for much more on Ebay to , presumably, newcomers to porcelain. My email is [email protected] . if you should like to question my expertise in these matters. As already said by others Chelsea raised anchor figures are very very rare, worth a lot of money and very very rarely witnessed outside of museums. A handful of very wealthy collectors may have an example perhaps. These wealthy collectors often leave their collections to the museums and gain some immortality by having their name linked with them. So, museums are a bit of a black hole where all these very precious items end up.